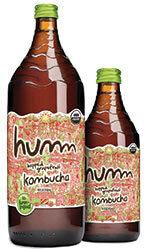 Bend, Ore.-based Humm Kombucha (hummkombucha.com) rolls out a multi-serve size of its authentic, organic kombucha. Now made using a proprietary fermentation process that improves flavor consistency and prevents an increase in alcohol percentage when the raw beverage is left unopened at room temperature, the new 40-ounce is available in five of the brand’s most popular organic flavors: Mango Passionfruit, Hopped Grapefruit, Blueberry Mint, Coconut Lime and Pomegranate Lemonade. Packed six to a case, each bottle contains five servings and 5.7 billion probiotic cultures. SRP is $7.99 to $8.99.